A Young's pub sitting at the bottom of Ealing Common. It had some ups and downs following a refurb towards the end of 2006, but it now seems to have found its feet and serves good beer and food in a not too posh atmosphere. There is a good sized outdoor seating area with picnic tables, heaters, and brollies (smoking is permitted). Inside is slightly soulless, but there are lots of tables. The bar itself is quite small though, which does occasionally lead to long waits while busy. Ale is from the Young's range and is kept very well. They have a large selection of bottled beers and the normal beers and cider you'd expect on tap plus Leffe. On Kake's February 2009 visit, Winter Warmer was £1.60/half, and Bombardier and Young's Ordinary were on as well. Billy comments that as of April 2007 the food is good, with large portions. Starters are around £5 and mains from £9-£15. 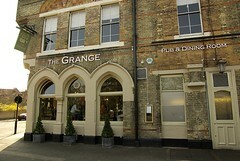 The menu changes regularly and includes upmarket versions of normal pub food as well as roasts on Sundays. Their desserts are also rather good, with traditional puddings and a cheeseboard coming in at around £5. According to the Young's website (November 2008), food is served noon-10:30pm Mondays-Saturdays and noon-10pm Sundays. Accessibility: One step up to get in, but the toilets (including one labelled as acessible) and most of the seating is on one level once you're in. Last visited by Kake, 5 February 2009. Opening hours and food times taken from Young's website, November 2008. Last edited 2013-05-10 07:16:44 (version 9; diff). List all versions. Page last edited 2013-05-10 07:16:44 (version 9).